Rovaniemi – the capital of Finnish Lapland – is located near the Arctic Circle at 66 ° 30 ‘ north latitude. The city is surrounded by nature’s wild north, between forests and grasslands, which are covered with snow in winter, the snow falls here for 180 days a year, making the landscape typical of Christmas. In winter, here you can also observe the beautiful aurora borealis. Rovaniemi is the town of Santa Claus, so here it is Christmas all year round, but of course during the real Christmas – between the end of November and the beginning of the year – the Christmas atmosphere is more intense, with many events and many attractions for adults and children. In Rovaniemi awaits a truly Christmas with the endless expanses of snow in Lapland, land of reindeer, frozen lakes and evergreen forests. The Santa Claus Village (Joulunavaus Joulupukin Pajakylässä) at the Arctic Circle – located about 6 km from the town of Rovaniemi in Finnish Lapland – it is a special place for every child. Here, you can visit an exhibition dedicated to Christmas and to the tradition of Santa Claus, you will find the home of Santa Claus and lots of Christmas items and craft shops of Lapland. At the Santa’s Village-Workshop, you can go shopping every day. The product range includes exquisite handicrafts. At Santa’s House you will find a wide range of customs and traditions of Christmas from around the world. 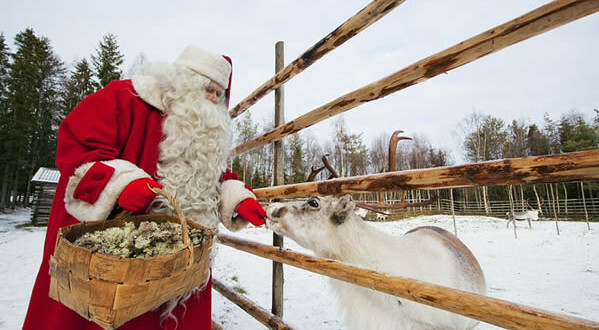 In Rovaniemi – in the idyllic natural environment of Finnish Lapland – you can observe the famous reindeer pulling the sleigh of Santa Claus, visit the forest of the Elfs and the Elfs School. Opening Hours: every day from 11am to 7pm.